Product code: Q364 Categories: Sold Items, Sold Jewellery. 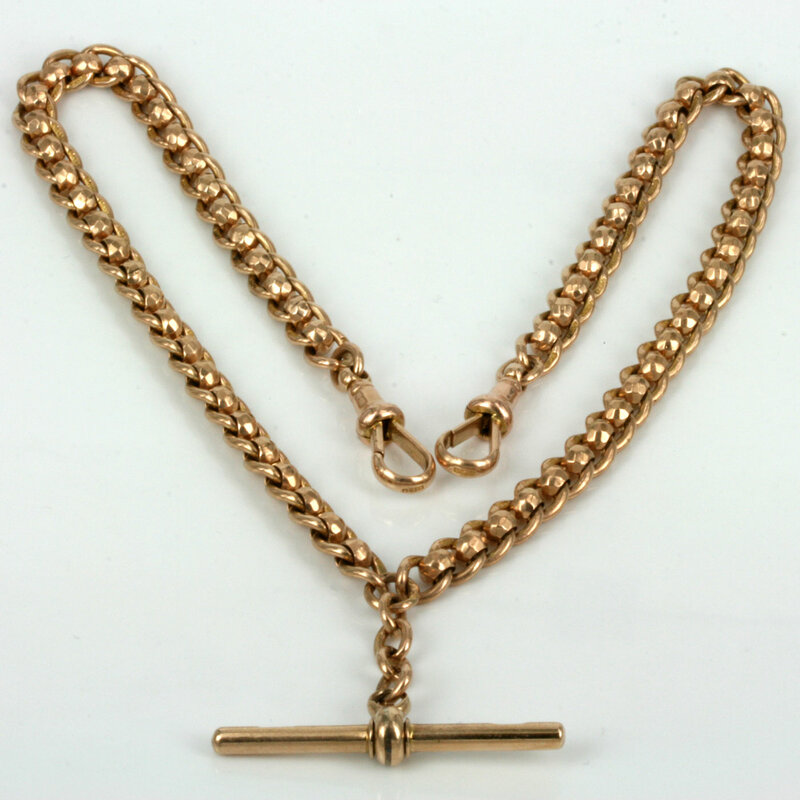 Here is a very beautiful solid gold double Albert/ fob watch chain that is in perfect condition and made with the most beautiful combination of links in rose gold. These chains were originally used to hold a gents pocket watch and have the name Albert chain as Prince Albert was fond of wearing his pocket watch on one of these styles of chains. The tee bar would have originally be placed through the button hold in the waistcoat with the pocket watch attached to one end and the key or seal attached to the other. When gents wrist watches came into fashion, these chains were suited for woman to wear around the neck which is how they are most commonly worn today. This particular Albert chain was made in Birmingham in 1923 and is made of solid 9ct rose gold curb links with amazing round facetted belcher links between each that rolls so beautifully through the fingers and around the neck and feels magnificent to wear. From end to end, the chain measures 40cm in length and each link measures 6mm wide. Each link is stamped and the colour of the rose gold is attractive and rose gold has become so popular and sought after today. This Albert chain is in perfect condition and looks and feels amazing and will always be loved.